Quentin Tarantino's long awaited so-called "masterpiece" Inglourious Basterds opened today at Cannes, and although reviews of the film are varied, most seem to agree that it isn't his best work. Inglourious Basterds, like many of Tarantino's other films, is an elaborate revenge fantasy, which follows a group of Jewish-American soldiers as they seek out Nazis to murder and mutilate in German-occupied France. With the name lifted from an old, little known Italian film, and inspiration drawn from spaghetti westerns, Tarantino crafts Inglourious Basterds from an interesting hodgepodge of influences, which sometimes works and sometimes doesn't. Brad Pitt plays the lead as a Tennessee-born hillbilly-turned-soldier who enjoys carving swastikas into every Nazi he encounters. While Pitt is ostensibly the star of the film, Austrian actor Christoph Waltz steals the show with his portrayal of a SS officer nicknamed the "Jew Hunter." Other big names include Dianne Kruger, Mike Myers, Rod Taylor, and Tarantino's personal friend and director of Hostel, Eli Roth. Clocking in at almost three hours, Inglourious Basterds outlives its welcome with most every critic, but some more so than others. Quentin Tarantino's cod-WW2 shlocker about a Jewish-American revenge squad intent on killing Nazis in German-occupied France is awful. It is achtung-achtung-ach-mein-Gott atrocious. It isn't funny; it isn't exciting; it isn't a realistic war movie, yet neither is it an entertaining genre spoof or a clever counterfactual wartime yarn. It isn't emotionally involving or deliciously ironic or a brilliant tissue of trash-pop references. Nothing like that. Brad Pitt gives the worst performance of his life, with a permanent smirk as if he's had the left side of his jaw injected with cement, and which he must uncomfortably maintain for long scenes on camera without dialogue. And those all-important movie allusions are entirely without zing, being to stately stuff such as the wartime German UFA studio, GW Pabst etc, for which Tarantino has no feeling, displaying just a solemn Euro-cinephilia that his heart isn't in. The expression on my face in the auditorium as the lights finally went up was like that of the first-night's audience at Springtime for Hitler. Except that there is no one from Dusseldorf called Rolf to cheer us up. The problem is that there's not enough roaring or headhunting. Tarantino, one of the most exceptional choreographers of blood-ballet working today, should have wielded a cleaver to whole sections of this 154-minute non-epic. There is far too much yakking, some of it thickly accented and hard to follow, most of it without the rhythmic zing of his best work. The violence – Brad Pitt as one of the Basterds wiggling his finger inside Diana Kruger's wounded leg – comes as a relief. A second plot, in which a Jewish woman whose family was butchered by Nazis organizes a film screening to assassinate Hitler and Goebbels – is more succinctly and powerfully handled. 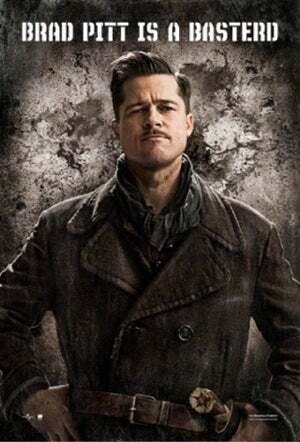 While World War II has probably inspired as much fiction as any other single topic in film history, "Inglourious Basterds" is one of the few to have brazenly altered history to such an extent. Because he carefully sets up the approach at the outset, as well as through his sense of style, Tarantino gets away with it, and is in a position to fine-tune the picture before locking a final cut. Other scenes ripe for pruning are all those featuring Hitler prior to the grand finale, interludes that come off as cartoony, unconvincing and unnecessary. In a true ensemble picture, Waltz stands head and shoulders above the rest with a lusty performance in the juiciest role. Laurent is appealingly thoughtful and observant as the young lady awaiting her chance, Fassbender cuts a dashing figure, speaks with a wonderfully clipped accent and rather resembles Daniel Day-Lewis here, and Kruger is far more engaging and animated than she's heretofore been in her big international pictures. Pitt clearly enjoys rolling his former moonshine runner's accent around in his mouth, although his performance is overly defined by constantly jutting jaw and furrowed brow. Inferring a measure of self-evaluation by Tarantino, some viewers will take exception to the film's final line, in which Aldo admires his climactic bit of brutal handiwork: "I think this just might be my masterpiece." Inglourious Basterds fails to be a masterpiece because if you make an epic about a little topic like avenging the Jews, you need some emotion. You need a little bit of soul stuck in with the wit and the cool and the trademark film geek insider references. I don't mean you have to get verklempt. But you want someone to hate a little bit-and someone to root for. You felt something when Thurman, as the pregnant bride in Kill Bill, was shot on her wedding day and her child taken away from her. By the time she killed Bill, you wanted him dead as much as she did. Masterpieces also need a protagonist to carry the story, or at least one who's visible. The star of this film is really Tarantino, telegraphing us in interviews prior to the film and while we watch it what a masterpiece it is while we search for someone to lead us onscreen. Pitt's energy and hilarious character helps. Waltz is a revelation. Kruger, playing a German actress and double agent named Bridget von Hammersmark gets to hold a cigarette like Marlene Dietrich and speak her native German. But there's no hero, or anti-hero, to give the film traction beyond its series of gorgeously shot, imaginatively written and acted scenes. In the words of Tarantino, it's "the power of cinema bringing down the Third Reich". Once again, the US director has blurred film genres. Essentially it's western meets war movie, with David Bowie on the soundtrack. And it becomes positively camp-operatic in parts - particularly in its portrayal of a shrill, semi-hysterical Adolf Hitler and British generals who could have been lifted from 'Allo, 'Allo. Pitt may get top billing, but he's not the star of the show. That honour goes to Christoph Waltz, a German TV star who plays SS officer Colonel Hans Landa. Inglourious Basterds opens August 21st.